You may have noticed that I haven’t been posting as much this month. My family has been dealing with some personal issues that we aren’t ready to discuss publicly yet, but it has left us with little in the way of appetite. I’m having a hard time focusing my thoughts to write new blog posts, and when I cook, I am gravitating toward comfort foods from my core repertoire, most of which I have already written about. 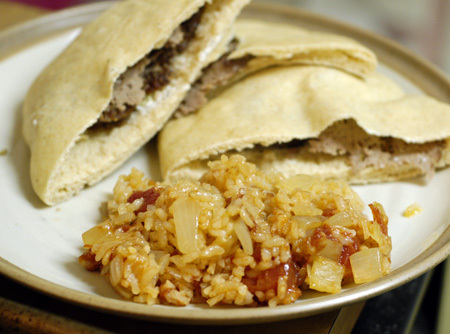 For instance, I made gyros and pita again this week on request, and mustered up enough energy to throw a rice dish into the oven alongside the meat. Bourani is a classic Greek preparation that is essentially rice baked with tomatoes, onion, and cinnamon. I’ve found that some of my very favorite rice dishes are the ones that get baked in the oven with homemade chicken stock, fat and all, and this one was no exception. Its flavor profile is very similar to Spanish rice, but the addition of cinnamon lends a subtly exotic flair. I cut this recipe in half and it still made enough for us to have leftovers. I omitted the parsley, used pickled banana pepper rather than Italian pepper, and opened a can of tomatoes now that I have run through my stash of garden tomatoes. In my opinion, homemade stock is highly recommended over water. Preheat oven to 375F. Saute onion in olive oil until translucent; add rice and cook until lightly browned, about 3-4 minutes. Pour rice mixture into an appropriately sized casserole dish and stir in all of remaining ingredients. Bake, uncovered, for about 45-50 minutes, until the rice is tender and the liquid has absorbed. (Check periodically and add additional liquid if it dries out too quickly during baking.) Remove from oven, cover with a towel and allow to rest for about 10 minutes. Serve warm. 4 servings. Source: The Food and Wine of Greece , by Diane Kochilas (p. 156).